Why deal with parking when you can Go Metro? 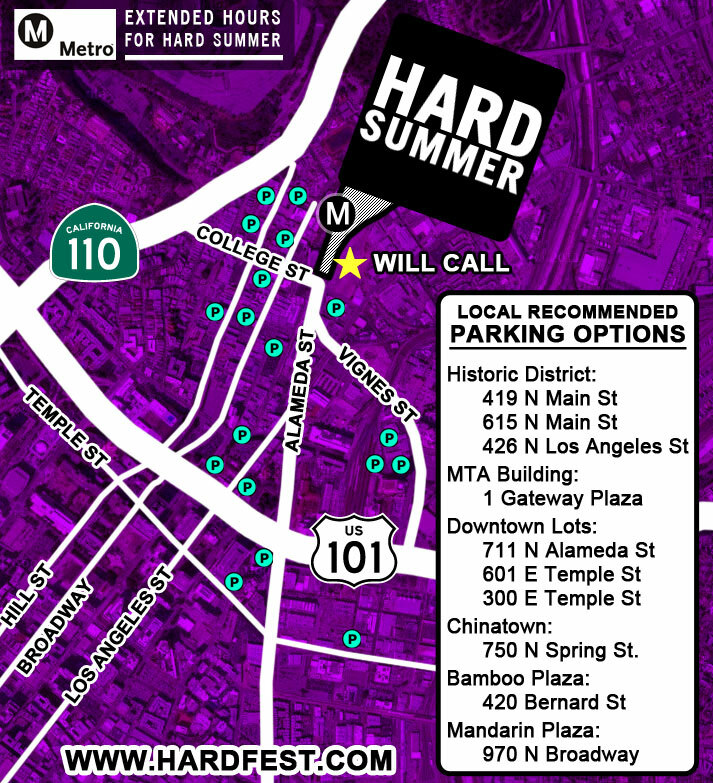 It's the easiest, safest and most affordable way to get to HARD Summer 2011. Party people listen up, Metro has partnered with HARD Events to provide extended late night service on the Red and Gold Lines on Saturday, August 6 for the HARD Summer Music Festival 2011. The festival – featuring acts including Chromeo, Ratatat and Odd Future – takes place at the Los Angeles Historic State Park in Chinatown, steps away from the Chinatown Gold Line Station. Parking is limited and will likely be expensive, so HARD recommends going Metro to the event. Metro will be running Red and Gold Line trains until just after the show ends around 2am. Other Metro rail lines will not be running extended schedules, so plan accordingly if you are connecting via the Blue or Green Lines. Metro has set up a helpful page for the extended service that will be updated with any changes, so be sure to check it out here. In addition, you can follow @MetroLosAngeles and @MetroLAalerts on Twitter for any updates. No eating, drinking allowed while riding Metro. To ensure public safety, Metro prohibits oversized items such as ladders, umbrellas, tents, chairs and coolers. And, be respectful of other riders. But most of all, have fun and take advantage of the extra service! This is an amazing partnership, I hope to see more like em to encourage new ridership and better service for existing riders. Holidays and Weekends with this kind of service would be something that could give Metro a new reputation. This is nice, but i really think Metro should find a way to extend hours on Thursday, Friday and Saturday Nights till 3am. The number of people that would use the trains at night would be pretty substantial. it doesnt have to be 5 minute headways, but at least some kind of service would be nice. i bet the red line between downtown and Hollywood would be packed. Hmm, that flyer shows one Gold Line Metro stop, ignores Union Station and shows almost two dozen parking lots? How is that transit friendly? Looks like lip service to me. Why can’t Metro partner up with the citizens of Los Angeles to provide us round the clock rail service??? It seems obvious to me that Metro decision makers have yet to board any of the rail lines they operate, basically another version of gerrymandering. All civil jobs that have direct say or power over public domain should require they are directly in “the mix.” LA City Council members should be required to live within the city limits (and district), no Orange or Ventura County commuters). And everyone at Metro should have a tap card that requires them to meet a monthly quota aboard Metro. Why the heck would anyone trust and want to ride Metro if its own board members don’t have the confidence to do so themselves? The only way Metro can succeed against over-congestion is by creating attractive alternatives for us drivers. Waiting for an overcrowded train for 30 minutes (the Purple line on Friday, Saturday & Sunday nights) and waiting an additional 20 minutes for the Red is not attractive or appealing when you can DRIVE to your same destination in 15 mins (at all hours of the day). I laugh at friends when I visit NY because they tend to suggest subway lines I should take because I would have to wait “like 5 minutes” for the train I was planning on riding lol. cant run the trains 24 hours in LA. They need to be able to do maintenance. New York has express tracks and local tracks and many routes so 24 hour service is feasible. But later service in LA over the weekend would keep a lot of trouble off the roads. @New Yorker: 24 hour service can be done in Los Angeles according to the staff in Metro Rail Operations. The problem has been with late night ridership (perhaps how to build it who knows). If maintenance must occur on a given line, trains can single track around an area or a bus bridge can be arranged. For example, single tracking occurs when police events happen, damage to a track happens, when Universal City had some work done Red Line trains ran on one track, or when the Blue Line tracks were married to the Expo Line tracks either a bus bridge occurred (weekends) or single tracking occurred (weekdays).